Titanium by name, titanium by nature? The graphics card dance continues to rumba on in the shape of Nvidia's GeForce GTX 560 Ti. It seems that pretty much every week of the last six months we've seen a new GPU design hit our desktops. If it isn't Nvidia refining and rolling out more and more spins of its rather speedy Fermi architecture it's AMD trying to keep pace with an opponent that had seemed to overtake it before rolling out its own brand new architecture. On the Nvidia side the GTX 480, the first Fermi card out of the green company, turned up less than a year ago and since then we've had ten different cards based on that architecture turn up. Possibly more, we've lost count to be honest what with the vast array of OEM cards it's spat out in the intervening time. Interestingly that long line of cards included rapid replacements of two of the first Fermi cards in the shape of the GTX 580 and then the GTX 570. Following on from that we've now got the GTX 560 Ti, essentially the direct replacement for the awesome GTX 460. Though that's not actually how it's running. The performance of the GTX 560 Ti actually means it's retiring the GTX 470 with the GTX 570 effectively retiring the GTX 480 and the GTX 580 just standing on it's own looking rather pleased with itself. But we'll get on to the performance soon enough. The fact the GTX 460 is still going to be kept around is interesting, and I for one am grateful for it. The excellent li'l card has only been around for a relatively short time and the pricing, especially now, is quite incredible. I've found full-fat, 1GB versions of the GTX 460 around for £130 and the 768MB version for £113. There's nothing at that price-point that can even come close to it, and when you factor in SLI it's nothing short of astonishingly quick. So what is this GTX 560 Ti malarkey then? Well, it's harking back to olden times for Nvidia nomenclature. The last 'Ti' (according to Nvidia that stands for 'Titanium') cards we saw tipped up in early 2003 with the GeForce 4 series. It's been brought back to denote the premium version of the GTX 560. Which intimates that we're going to see more spins of this volume-flogging card, though hopefully without the confusion that surrounded the 'Special Edition' GTX 460 which floated around the etailers like a poo in the swimming pool pre-Christmas. 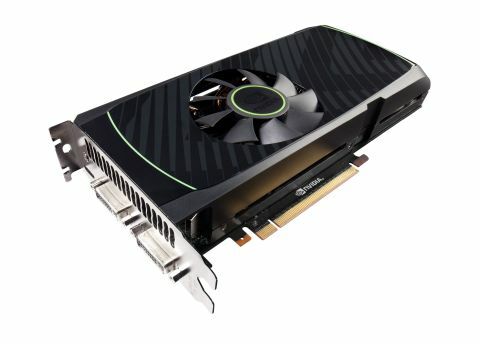 In competition terms the GTX 560 Ti is being pitched directly against AMD's sub-£200 Radeon HD 6870, but is also touted by Nvidia as something that can also take on AMD's Cayman-powered Radeon HD 6950.